A lot of Vegas is promised and a lot of Vegas it is. Mucho Vegas online casino is a brand new slot site with fiery Mexico theme. Whether you like Spinata Grande, Tacos or Playa del Carmen, you’ll like Mucho Vegas. At this slot site, you will feel at home, find slots you recognize, get a fat deposit bonus and taco-spiced campaigns that will make your casino experience enjoyable. Muchos Vegas is not a selfish casino when it comes to the deposit bonus. It is refreshing that a new slot site will triple your first deposit up to £100 and it doesn’t stop there, oh no Jose! 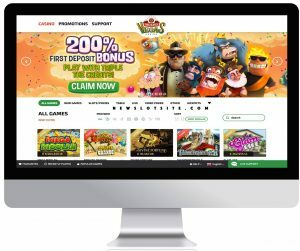 Somehow unbelievable seven deposit bonuses in a row are thrown at us it with a final deposit is loaded with 150 free spins as the icing on the cake. In total, there are £1500 to collect. The total bonus offer is £1500, which also includes 150 free spins. Due to the Mexican theme, there is no better way to connect free spins and slots than use the favorite game Spinata Grande. The wagering requirement is 30 times the money, which is lower than most other casino companies. There is no doubt that you’ll have a good value of your deposit. In the fine print (terms and conditions) it is worth taking into account the fact that a maximum of £7,5 can be wagered per spin regarding the bonus money. If not, it would be just too easy to make money. The team behind Mucho Vegas likes giving away free spins to its customers. Every Tuesday morning, all customers who made at least two deposits during Monday will receive between 25 and 100 free spins. The minimum deposit to take advantage of this offer is £25. Mucho Vegas does not stop there. To celebrate the toughest part of the week is over and the weekend begins, they offer all players a deposit bonus of 100% up to £100. The same generous deposit requirement of 30 times the money comes with a minimum deposit of £25. Mucho Vegas continues to offer surprises. Every spin is rewarded. As a loyal player, you will appreciate this concept of collection points. The points you can collect are in a Mexico-inspired manner is called “Fiesta points” You will get 1 point for each £1 wagered. On top of that, you will get additional £5 for free that you can use on other games like Blackjack or Roulette. You can also switch the Fiesta points into cash at any time. The exchange rate is 100 points for a pound. In addition, there are bonus levels divided into a latter (milestones) where UK players, for example, receive 20 free spins for 10 000 points and the entire £500 and VIP status when 500.000 points are reached. It may be a lot, but remember that it’s money in total revenue, not your deposit. In theory, that means you can deposit 25 pounds, winning and losing again and again until you have collected the points needed for £500. A little tricky to understand fully perhaps, if you have questions, please contact us via our contact email or ask support at Mucho Vegas. The hat, or maybe sombrero of Mucho Vegas is one of the best new slot sites launched this year. That is because of the quick registration process, fun theme and the great bonus. The wagering requirement is on the low 30 makes it to a casino where you can earn real money solely on the bonuses. The smart player chooses obviously to max out the free spins on Mondays and reload bonus of 100% up to £100 every Wednesday. The only downside is to keep track of all the milestones and rules, but you will get the hang of it quickly. If you do this, you can be sure that you will be rewarded with “Fiesta points” which you can switch to real money or free spins.